Schapelle Corby's boogie-board bag was the only bag not scanned at Sydney Airport. This is directly confirmed by correspondence between the Justice & Customs Minister, the AFP, and a number of other parties. Whilst this information clearly constituted vital primary evidence, it was withheld from Schapelle Corby, her lawyers, and the Bali court. Equally, it has subsequently been shown that a substantial number of baggage handlers and other staff were engaged in criminal activities, with dozens having convictions for a range of serious criminal offences. Indeed, the government was awash with information which conclusively proved this, including the Kessing Reports and Kim Beazley's paper, A Nation Unprepared. However, to the media, to the public, and thus to the Bali court, the Australian government presented an entirely different picture. The following briefing note, from the Attorney-General's Department, demonstrates how a scripted response carefully created the impression of efficient baggage screening and a workforce verified to be honest, without even a hint of the real situation. The false picture this painted was repeated consistently, with the precise phraseology being carried across multiple scripts. 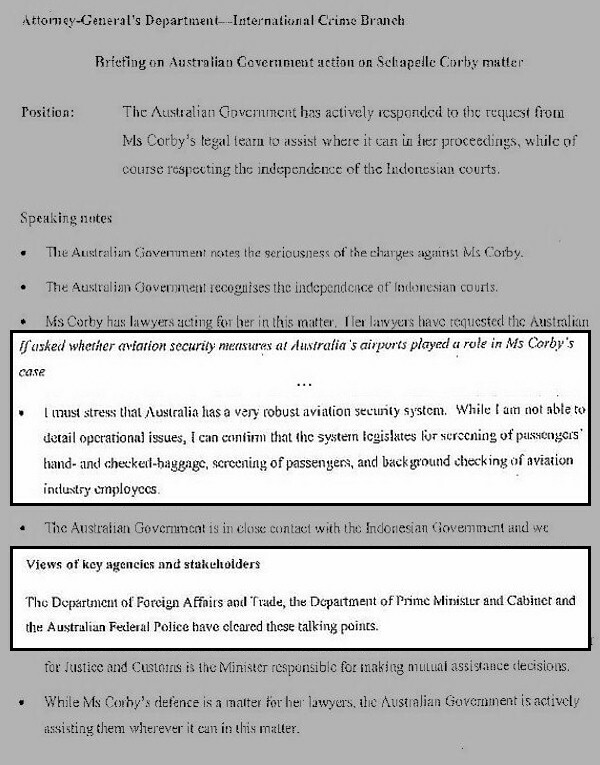 It presents yet another clear example of how Australian politicians, not only withheld truthful and factual information, but spun wholly misleading messages to suit their own agenda, regardless of the grave impact upon Schapelle Corby. The Attorney-General's Department embraced the role and functionality of the Minister for Justice and Customs, Christopher Ellison and the Australian Federal Police.